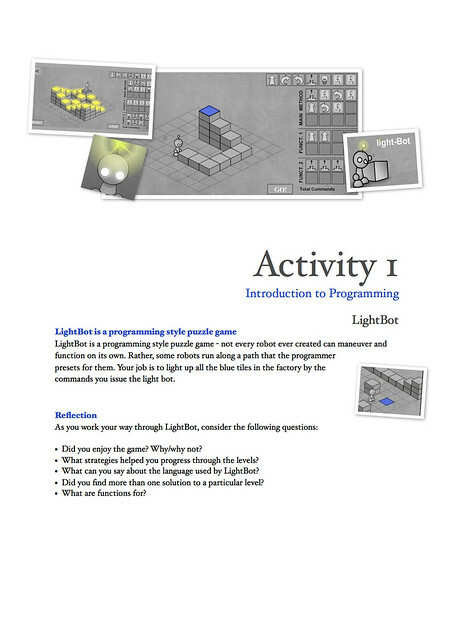 Before students come to Quantum Victoria and do some robotics work, some understanding of basic programming concepts is beneficial. 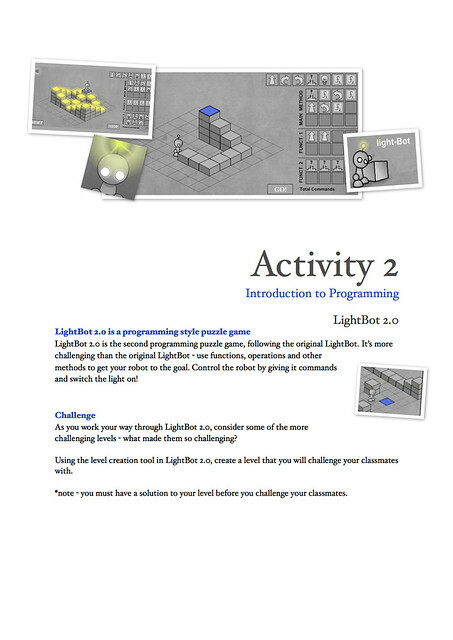 Attached are two pre-visit activities that teachers can use with their students based around the game LightBot. 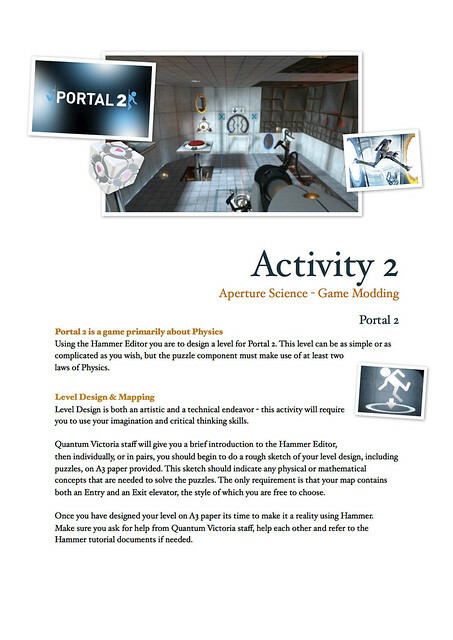 Also find some brief teacher notes as a Google Doc. *These are draft documents. Feedback welcome! Out of Our Minds: Learning to Be Creative is a book that, for the most part, I thoroughly enjoyed. Sir Ken gives a very broad overview of a changing world, a broken education system, shares anecdotes that sometimes relate to the points that he is trying to make and gives the reader a general framework for being a creative leader. Imagination – the source of creativity. The ability to bring to mind things that are not present in our senses. Creativity – the process of having original ideas. Creativity is applied Imagination. Innovation – the process of putting new ideas into practice. Innovation is applied Creativity. and speaks about cultural aversions to change and why resistance to change is only natural. After attending the Creative Innovation 2011 conference recently, I now know that many of the speakers where actually directly quoting this book as the book – and this is what is worrying me. In 1780, Jacques Rousseau published Emile, in which he argued for a new approach to education that was based on play, games, pleasure and personal interests. For the next 200+ years their have been many who have argued for a more playful and creative education system, those such as Froebel, Montessori, Steiner, Orff, Dewey and Kohn, and yet despite their efforts, they have gone largely ignored. But in the fast-changing world of the 21st century, every business, government official and education leader wants a quick dose of creativity and innovation and will pay whatever it takes to say they have done the latest ‘Sir Ken’ workshop, and this in turn ticks the necessary innovation box. But can you actually ‘teach’ creativity? Granted, a framework can be introduced to encourage ‘creative’ thinking and a ‘creative’ culture and work environment (think Google), but in an age of the quick-fix workshop, how many of these organizations are willing to invest in long-term strategies to really drive systemic change toward a more creative and innovative environment? Take the time to read this review of Out of Our Minds on Amazon – Is Creativity the New Snake Oil? Is Creativity the New Snake Oil? The Creative Innovation conference finished on Friday with an incredible program of speakers on the day including Ray Kurzweil, Edward Debono, Rufus Black, Paddy Miller, Brendan Boyle & Tan Le. From an education perspective, the conference was a great chance to meet and network with people from business, industry, philanthropy and to talk to many successful entrepreneurs. Kurzweil stated in his talk that, “most people in developed countries are doing jobs that did not exist when they were born.” and this was clearly supported with some of the job titles of the people that I met throughout the conference – titles such as, Innovation Architect, Chief Fulfiller of Needs, Life Coach, Inventiologist, Changemaker, Bubbleologist, Bubbleosopher, Chief Ideas Officer, Thinking Strategist etc. Education is too insular – we need to get out more and see what is happening in the world, to meet people with different backgrounds and interests, to see what is happening in business and industry – this allows for cross-sector collaboration and pollination. Many of the people I met are very eager to work with people in education, but just need an entry point. The purchase of an emotiv EPOC headset (with the SDK) to see how Quantum Victoria can use brain-machine interface and neuro-technology to re-energize interest in science among secondary school students. Research Brendan Boyle’s d.School at Stanford University. Brendan was a real class-act and very generous with his time. He spoke at length about the principles of design thinking and the importance of play. The philosophy of making play part of the process to increase creativity and innovation was supported by the idea that play should involve 1.Role Play 2. The Encouragement of Ridiculous – the ebb and flow of ideas 3. Thinking with your hands. He shared many fun examples of students using design thinking in whimsical ways. The Institute of Design at Stanford have made available all their material on design thinking and creative processes available for anyone to use – definitely something to investigate further. And finally, Paddy Miller blew me away with his work on creating an ecosystem for innovation – definitely check out his book the Innovation Architect when it becomes available. Recording video is very simple too – have your TV switched to PC, load Arcsoft Total Media (that comes with the HDPVR), click capture, switch your TV back to Component and play whatever game you have in your console. Once you have captured enough video, turn the TV back to PC, click stop capture and video will be saved to your hard drive. 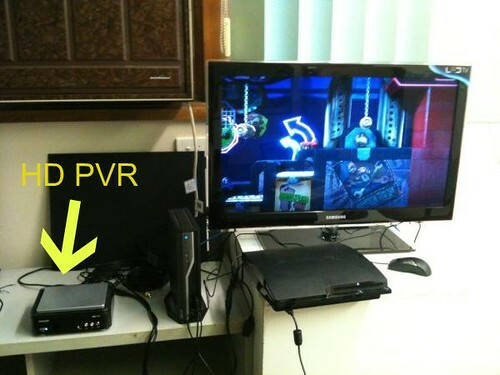 Using a PS3, the file format output is .M2TS which is a H.264 format that will load directly into your video editing software or to Youtube. This is my first recording. The quality isn’t spectacular – it was recorded at 5Mbit/s at 720 x 480. This 20 second video comes out at 17.9 Mb. The computer I have connected at the moment is an Intel i3 3.3Ghz, 4GB of RAM with onboard graphics. I think this is currently the issue – I will test it again by connecting to my AlienWare M14x to see if I can get an increase in quality. Be interested to hear what people think of this handbook.